A 40-inch ultra HD curved LCD monitor with the ability to display up to four full HD inputs simultaneously, Philips’ BDM4037UW seems like the perfect large monitor for a multi-platform gamer. And it would be, if not for a couple small missteps and one large stumble. The “MultiView” feature, as Philips calls it, is what drew me to the BDM4037UW. I wouldn’t normally consider a monitor this large for computer desk use, preferring something smaller and more intimate. But I wasn’t looking at it as one large 4K screen. I was imagining four 1080p screens in two rows of two, on a display large enough that I could comfortably play a game or work on any of its four corners, just like the guy in this promotional shot. Well, maybe not just like him. I use a mouse, for one. And my beard is better. His hair and cardigan game are on point though. And though it took some doing, I accomplished what I set out to do with the monitor. It wasn’t easy, and performance issues kept the experience from being as amazing as I’d hoped, but it was still pretty damn cool. To facilitate four inputs at once, the unit is outfitted with a nice selection of ports. The BDM4037UW has room for two Display Port connections, two HDMI (one 1.4 and one 2.0) connections and, oddly enough, one VGA connection, in case you’re trying to connect an older device or just really like VGA cables. There’s an audio input, a headphone jack, an optical audio port and four USB 3.0 connections, one of which is fast-charging. The monitor does feature on-board speakers, but they aren’t great, and if you’re using your monitor’s speakers you don’t care about audio anyway. Those Curves: A shining silver knight on a desktop used to monitors with shadowy black frames, Philip’s BDM4037UW features a gentle curve that delivers a cinematic experience in a small-ish space. Its larger radian (the 3000R in the specs, which basically measures the radius of the circle that would be created if the curve continued all the way around) makes for a more subtle curve, so switching back and forth between this and a flat screen isn’t jarring. It’s a great-looking piece of technology. Blacks and Contrast: The BDM4037UW features a VA (vertical alignment) LED panel, which has strengths and weaknesses when compared to other panel types. Where VA excels is blocking out backlight when displaying dark colors, which leads to deeper blacks and higher contrast ratios. My absolute favorite thing about this monitor is how rich the blacks are. Even in a bright room with one of my camera lights pointed directly at the screen, it’s full of inky goodness. Uniform Lighting: I expected a curved display of this size to have some bright and dark spots, particularly around the edges of the screen, but the BDM4037UW provides uniform brightness across the whole screen. Coupled with fairly excellent color reproduction (99 percent of the sRGB color space and 84.6 of Adobe), it’s a very nice screen to work with, as long as you aren’t working too fast. MultiView is a Neat Trick: While the BDM4037UW can do a mean picture-in-picture, MultiView is where it’s at. 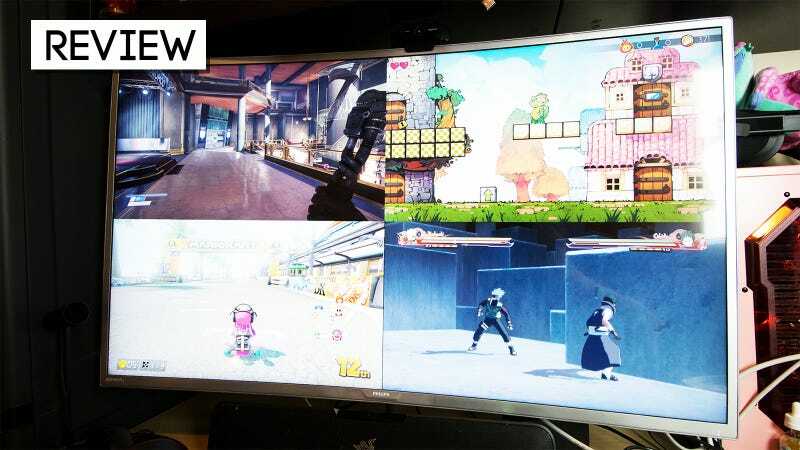 Between two and four different sources can be plugged into the unit (ports willing) and displayed in full 1920 by 1080 resolution side-by-side, top-to-bottom or two-by-two. The signal doesn’t degrade. The response time doesn’t drop. And while I have no need to play four games at the same time, being able to display them all at once makes me feel like gamer Batman. The Control Stick: Normally I’d be all for a control stick, but the one that handles all of the BDM4037UW’s operations is located on the lower left corner of the back of a very wide monitor. There’s no remote control, so switching between sources, adjusting the volume and other important operations require the user give the unit a reach-around. The Stand: With no left-and-right swivel and only 10 degrees of tilt, there’s not much maneuvering for the BDM4037UW to do, which can make it much harder to get to that rear control stick I mentioned. Plus it’s got a bit of a wobble to it, which is never fun. Ghosting: I had heard that VA panels have trouble with delayed response shifting between color states, but I did not expect the resulting ghosting effect to be so pronounced. Ghosting is what happens when an object moves on the screen and the pixels take a second to catch up, leaving a ghostly afterimage or trail behind. It’s like there’s a slight, quickly fading smear following whatever is moving on the screen. When the thing moving and the background it’s moving against are close in color and shade, say a shadowy figure skulking through the darkness, the effect is not as pronounced. In faster scenes with a higher color variance, it’s downright painful. There’s an overdrive option in the menu that speeds up the pixel transitions somewhat, but the ghosting never goes away completely. It’s the sort of effect you might not notice in normal day to day use, but all it takes is one blurred game or video and you can’t unsee it. Philips’ BDM4037UW 40-inch curved LDC has been an absolute joy to work on over the past several months. It’s got a massive amount of screen real estate to play with, and when I’ve found myself working with multiple computers at once, its MultiView capability has come in very handy. If you do a lot of writing, photo editing, video production and web browsing and you have a desk wide and deep enough to take it, this is a very good monitor. But that’s work. What attracted me to the BDM4037UW was its potential for playing games and watching videos, and the ghosting ruins both of those for me. I would not recommend it for gaming purposes. This weekend I took the BDM4037UW off of my desk, boxing up the review unit for return to Philips. I’ve replaced it with a comically tiny 25-inch LG ultrawide. I miss the work space, but when I start up a game (leaning in really close to see everything) and I don’t get trails, I don’t miss it nearly as much.